This was a regular, scheduled, Climbing-Knapsack Section peak climb for this Memorial Day holiday weekend. We all witnessed a spectacular sunset Friday, while driving east on I-80, then on Alt. U.S. 50. There was a rainbow, and brightly lit, colorful clouds, well past Reno. After my car camp, we met Saturday morning at the International Hotel in Austin, NV for a nice breakfast. It is a fine tradition that we can have a great meal, in some leisure, with plenty of coffee served. Going back a bit west on Alt. 50, we took the paved road going south along the Reese River Valley. A long way south, after the road turns to dirt, a sign indicates the turnoff for our trailhead. A high clearance vehicle is desirable for the river and creek crossings, and the washboarded dirt road to its end. My economy passenger wagon did just fine, but some cars would have a problem in other, higher, water years. 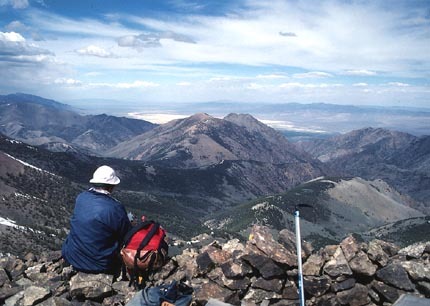 Two other hikers were ready to go at the Columbine Trailhead, on the west side of the Toiyabe Range. It was about 9:30 a.m. We quickly had some trail finding problems. There is a large, boggy meadow where the path becomes indistinct, but one just heads straight across to pick it up on the far side. Having good guidebook directions (Hiking the Great Basin, by John Hart), we found the trail, and followed it up to where it became more clear, and better. 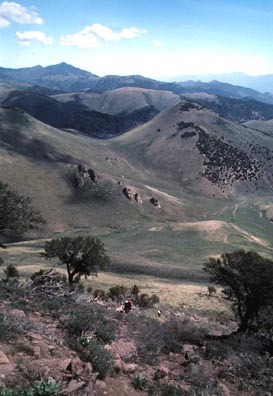 The good trail ascends to the crest of the Toiyabe Range, of which this is the southern part. Descending slightly on the east side, a trail junction is followed right and up south to a large, relatively flat, rocky plateau. We came to a view of the glacial cirque, with still plenty of snow, on the main ridge's east side. There is another cirque, further along, on the west side. Continuing along the summit trail, an old jeep track comes up from the west. This is a longer hike, but can be reached from our same trailhead (see guidebook). As we hiked toward the clearly distinct peak itself, the trail begins to drop downward, and disappears. We headed cross-country toward the summit, not wanting to let this spoil our fun. A field of alpine wildflowers, with phlox, is sparsely distributed at this high altitude. 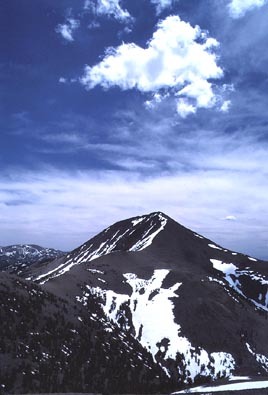 A cloud floated above the summit mass (photo). As we came to the final uphill climb, the trail appears again, and switchbacks to the top. Our time was about five hours to the top. A NAS register in a PVC pipe awaited our signatures. The Northern Alpine Section was another peak climbing section in the same local chapter, with far more numeric support. But, they have less drive and taste for ambitious outings. At one time, it was the only group to go with, but with limited goals. It was later geared to Singles groups, which probably led ultimately to its demise. But before it went, the Climbing-Knapsack Section was axed, and with it, the finest set of wilderness activities that had ever been conducted in the area. The two others relaxed in the summit rock rings, and I took pictures. The view was impressive. The Arc Dome Wilderness is probably the nicest, wilderness, trail hiking op in the center part of the state. There is another ascent route from the east, via the Twin Rivers. This is said to be "the finest gorge" in the Great Basin (John Hart, Hiking the Great Basin). I was to hike the Twin Rivers loop in the next year. The summit light was soft. There were some high clouds. I snapped a lot of photos. After I read through the register book, we started back. We saw an impressive display of the clear air and open country that, hopefully, will remain forever undeveloped. Back to the cars at dusk, we had a nice car camp near the trailhead. We were joined late at night by another climber for our second peak. I had been tired, and went to bed early. I was quite out in my sleeping bag, laid out in the back of my wagon. Sunday morning, we motored back over to the main dirt road, then found and took a dirt road west to the mouth of Bonita Canyon. Parking, we hiked up the dirt track, then went cross-country, by the north ridge, to the summit of South Shoshone Peak. This was an easier, although trail less, climb through sagebrush, pinyon pines, and mountain mahogany. A cairn and register greeted us there, too. The skies were filled with puffy clouds. It does rain, even heavily, out here, so one has to watch the weather. We headed back and came back to the cars early in the afternoon. Since I had led the two peaks, with no other climbs nearby, I terminated the trip and headed home, which the others would do anyway after another night's camping. Seizing an opportunity, I took the main dirt road south, and west, to the Berlin-Ichthyosaur State Park. Arriving, just in time, for the last ranger tour at 4 p.m. (1985), I was able to see the fossils of an ichthyosaur. This was a very large, fish-like reptile, or dinosaur, that lived in an ocean, hundreds of millions of years ago. This is housed in an expensive-looking building, which was impressive, for the State of Nevada. This was considered a prime paleontologic find at the time. I was to later come back here in 1998 to find that much has been learned, or additionally supposed, about the ichthyosaurs. I drove through the old town of Ione, NV, then came back north to U.S. 50. I continued all the way home. While camping is usually nice, I was concerned about getting a good night's sleep at home, on my bed. Having slept countless nights on the ground or in my car, I chose to spend my day off in town.